Introducing the first seasonal, themed pack for Lumines Live! A collection of 20 brand new skins featuring Halloween spookiness to snowflake wonderland, this Rockin' Holiday Pack is the newest addition to the Challenge Mode. The stylish skins come alive with tracks from genres never seen in the Lumines series - from heavy metal, UK rock to gabber, the pack features a little something for everyone! Amazing artist collaborations including Keiichi Sugiyama (Rez, Area 1), h ueda (Every Extend Extra Extreme), and Takayuki Nakamura of Brainstorm (Lumines series). *Standard Edition required. There are no refunds for this item. For more information, see www.xbox.com/live/accounts. Tokyo Club Mix Pack - LUMINES™ LIVE! Feel the beats and see the visuals from four of the hottest DJs, artists and VJs, with Tokyo Club Mix Pack! Fast-emerging Japanese DJ Sugiurumn is already making it big on the international scene, funky DJ unit TECHRIDERS keeps it fresh with their mix of audiovisuals, rising DJ Malo and his unit Muku are dropping the beats and the Tetsuya Mizuguchi-produced hybrid group Genki Rockets presents a special "Heavenly Star SOS Remix." Standard Edition required. There are no refunds for this item. For more information, see www.xbox.com/live/accounts. 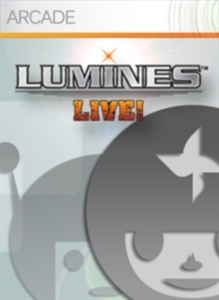 Booster Pack - LUMINES™ LIVE! LUMINES addicts, are you ready for next challenge? Presenting the latest addition to the Challenge Mode, this Booster Pack features 20 stylish skins including some brand new, never before seen designs. A must-see is the unique collaboration between LUMINES and “Bloomy Girls,” a colorful and lively piece created by striking Japanese video artist/musician Masakatsu Takagi. You can also customize your LUMINES experience by selecting your favorite skins once you have cleared them and line them up with your favorites from other packs! Good luck in clearing all of the skins! Standard Edition required. There are no refunds for this item. For more information, see www.xbox.com/live/accounts. VS CPU Character Pics 1 - LUMINES™ LIVE! Finally, a chance to own those cool LUMINES avatars as Gamer Icons! 5 stylish LUMINES VS CPU avatars are included in one pack. There are no refunds for this item. For more information, see www.xbox.com/live/accounts. Character Pics 2 - LUMINES™ LIVE! Finally, a chance to own those cool LUMINES avatars as Gamer Icons! 5 stylish LUMINES avatars are included in one pack. There are no refunds for this item. For more information, see www.xbox.com/live/accounts. Character Pics 1 - LUMINES™ LIVE! Character Pics 3 - LUMINES™ LIVE! Finally, a chance to own those cool LUMINES avatars as Gamer Icons! There are no refunds for this item. For more information, see www.xbox.com/live/accounts. VS CPU Pack - LUMINES™ LIVE! Here's your chance to rage against the machine with 9 new opponents! Challenge the CPU and show that box who's boss with the VS CPU Pack for LUMINES LIVE! With each stage, you get some stylin'-themed skin and character designs. And if you can walk your talk, a special bonus skin awaits you at the very end of the challenge! VS CPU Pack requires the LUMINES™ LIVE! Standard Edition for play. There are no refunds for this item. For more information, see www.xbox.com/live/accounts. Puzzle/Mission Pack - LUMINES™ LIVE! LUMINES™ LIVE! is not just about dropping blocks. In Puzzle mode, you have to use just the right blocks to create a certain shape. In the brand new Mission mode, you'll have to clear all blocks in a tightly limited number of moves. With 90 additional puzzles to solve 40 new missions to clear, you won't want to miss this Pack! LUMINES™ LIVE! Standard Edition must be downloaded in order to play Puzzle/Mission Pack. There are no refunds for this item. For more information, see www.xbox.com/live/accounts. Advance Challenge Pack - LUMINES™ LIVE! Feeling feisty and up for a new challenge? The Advance Challenge Pack for LUMINES™ LIVE! adds some edge to the Standard Edition with more challenging gameplay and 20 all-new skins! After clearing your favorite skins in Skin Edit mode, customize your gameplay experience! Don't miss out on your chance to own these fresh, cool skins! There are no refunds for this item. For more information, see www.xbox.com/live/accounts. Single Player, Local Multiplayer, HD (High Definition). LUMINES LIVE! – a fresh installment to the original blockbuster series now offers a deeply rich and totally cool gaming experience. Harnessing the power of the Xbox 360™, LUMINES LIVE! provides a fabulous collection of music and newly designed skins. Upgrade to the Full Game – LUMINES™ LIVE! Standard Edition to enjoy full multiplayer mode on Xbox Live® and customize the game even more with plenty of additional downloadable content available via Xbox Live Marketplace. Give this stylish, highly addictive game a try today!